I am a huge advocate of anything "Greek" inspired, especially when it comes to feta, so I knew I would love this recipe. It is so simple, but the vinaigrette takes it to a whole new level. Each bite is so satisfying and flavorful. I mean how can you resist pasta, cheese, veggies and a yummy dressing?? I know I can't. You've got to make this one for your next family get together! 1. Cook the pasta al dente in a large stockpot of generously-salted water according to package instructions. Drain pasta, then rinse under cold water for about 20-30 seconds until no longer hot. Transfer the pasta to a large mixing bowl and let cool. 2. Whisk all of the lemon-herb vinaigrette ingredients together in a small bowl until combined. Set aside. 3. 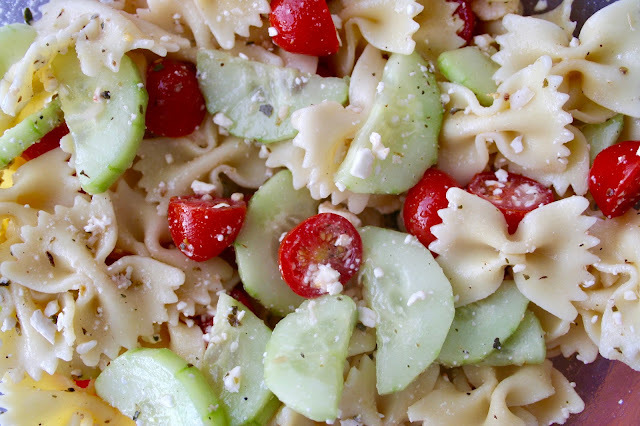 Add cucumber, tomatoes and feta cheese to the mixing bowl, then drizzle all of the vinaigrette evenly on top. Toss until all of the ingredients are evenly coated with the dressing. 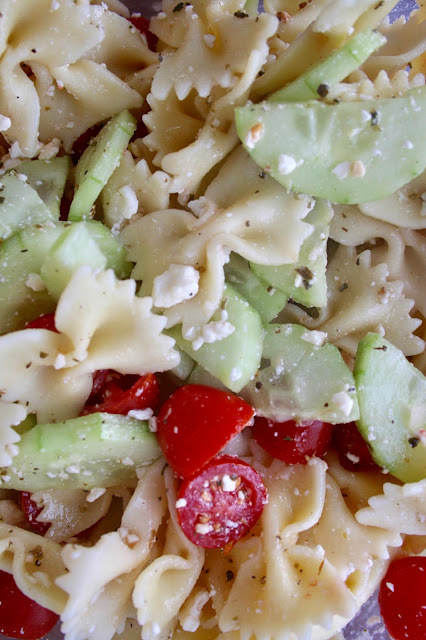 Serve immediately, garnished with extra feta and black pepper if desired.